I remember the first major prayer I ever had answered. I don't remember my exact age--I think I was between five and seven. My brother and I were exploring around my father's hunting camp. He and his guiding partner had two permanent camps, and we were taking a family trip to the one on the Ram River. 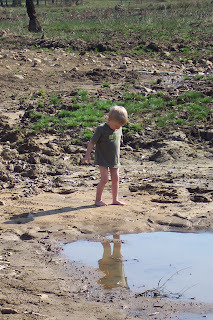 Logan, who is two years younger than me, and I--like typical children who are convinced that they are strong and powerful and can do anything--decided to scale the fairly steep shale side of the creek, rather than go up and around on the path. Being older (I wish I could say that it made me wiser, but that wasn't so), I pushed on ahead and up, "showing my brother how it's done." This was my undoing. I felt the shale start sliding down, me along with it. Every step only seemed to make the situation worse, so I did what any girl of my age and experience would have done--I panicked. I froze, and hollered my head off, while Logan looked on helplessly below. Actually, Logan may have gone back for help, I don't remember. At any rate, while I was standing on that uncertain ground, trying not to breathe lest it let loose a landslide (oo, alliteration points), I prayed. A lot. And soon, the answer to my prayer came in the body of my dad's partner, Mr. Curry. He plucked me off that shale slope like a kitten out of a tree, sliding carefully back down to the more stable rocks on the edge of the creek below (which were very narrow, thus the reason I had been terrified to try that myself, lest I go straight over the edge into the rushing water.) That always made an impact on me, and I always knew that God had used that man--a confirmed atheist--to answer my fervent prayer. Sunday morning, Jude and Jabin asked if they could go out to see Grandpa Mike, who was working on the dam on their property with the backhoe. He has been trying to drain their upper pond completely, so he can rebuild the dam properly--it had been badly damaged with time and weather. The dam is just made of clay, as is the bed of the pond, and the receding waters have left some rather silty spots. Five or ten minutes after they went out, the phone rang. It was Mike: "Grab your cameras and come out to the dam. The boys are stuck." Mike had seen the boys trucking across the pasture, dip down into the pond hollow, and after they didn't reappear after a couple of minutes, he went to investigate. When he came into view, he found Jude buried in mud up to his knees, and Jabin up to his calves. The latter was laughing his head off--and the former was howling and sobbing at the top of his lungs. Every syllable became three between his gasps for air. "I-I-I prayed to God for he-e-elp, and he didn't do--oo--oo anythi--i-ing!" "Sure he did," exclaimed Mike. "I'm here, aren't I?" "But he didn't do it when I wanted him to!" "That's something you've got to learn--he doesn't always answer our prayers the way we want. Now cowboy up and stop crying. What's the first thing you do when you get in a bad situation like this?" Jude started to calm down, and said through his tears, "Pray?" "Help, yes, but in what way? What do you pray for before your meals sometimes?" "Yes, wisdom. Then you stop and use your head and figure out how to get out of the mess." "Aren't you going to get me out?" Jude exclaimed. "I didn't get you in there! Why should I get you out?" Through a little coaching, Mike helped Jude figure out how to get himself out of the "quicksand." By the time we got out there with our cameras, Jabin was wandering around the edge of the soft spot, naked from the waist down. 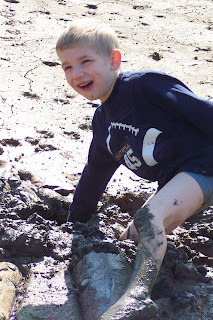 Jude was naked except his shirt and underwear, and was digging into the mud with his hands trying to find his mudboots! It was quite a hilarious sight, I have to admit. It's too bad more kids don't have adults reminding them that just because God doesn't answer their prayers the way they expect it doesn't mean he didn't answer them. And it's too bad more adults don't remember that just because the "cavalry" looks like someone who was already on their way to help when they prayed, it doesn't mean that God didn't send them in the first place. Prayer works. I knew that on a cliff of slippery rock. Jude learned that in a sinkhole in the Back 40. I find myself all to often thinking just like Jude did. What a great story and object lesson. Man, what a fantastic story to remind your boys of when they're older. Though I don't suppose Jude will forget this one too soon. Glad Mike had the where with all to use that teachable moment. WISE! 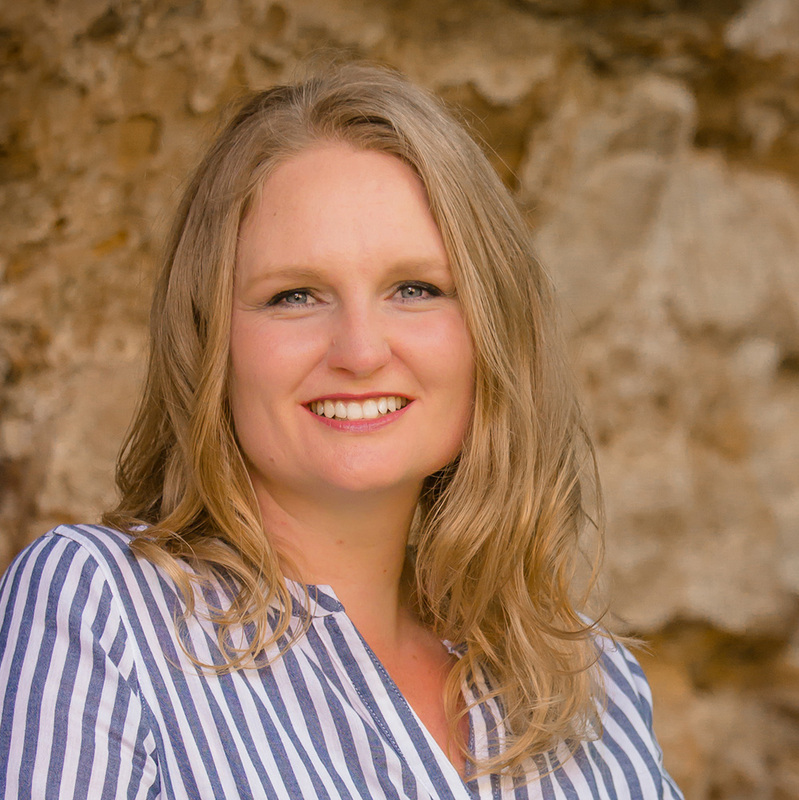 Anne - :-) Glad to entertain! Richie - Me too. Good thing God sends us reminders like this once in a while, eh? Too cool. Mike, that rocked.